Welcome to Riviera Maya, also known as the Mayan Riviera. The Riviera Maya is a stretch of Caribbean coastline that starts just south of Cancun and runs down to the Mayan ruins of Tulum. The Riviera Maya includes, Playa Paraiso, Puerto Morelos, Maroma Beach, Playa Del Carmen, Playacar, Puerto Aventuras, Akumal, Tulum and more. Here you will find an abundance of possibilities; Tropical Beaches * Ancient Ruins * Great Marine Life. There is something for every person of any age, for every type of vacation, for every budget and every activity... The Mayan Riviera offers an unrivaled combination of high quality all-inclusive resorts to fit all budgets, relaxing beaches, great shopping, dining and nightlife. Enjoy your dream vacation with incredible values under the sun! With it’s great location, close to Cancun, Cozumel and the most popular sites, it’s no wonder that a Riviera Maya Vacation is a favorite of our clients! IBEROSTAR HOTELS & RESORTS are Riviera Maya's #1 Hotel chain. 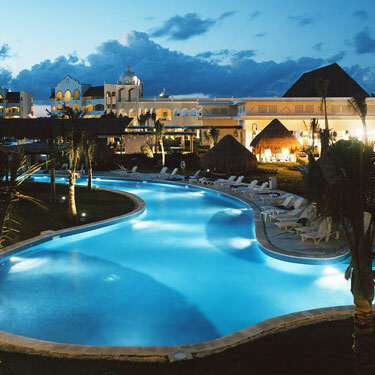 IBEROSTAR PARAISO LINDO is the perfect resort for families & couples! Located only a few minutes from the Cancun Airport, and situation on a Playa Paraiso Beach, this great resort has it all! From unique features such as LAZY RIVER, WAVE POOL & MORE! Book now and see why Iberostar Guests always come back! 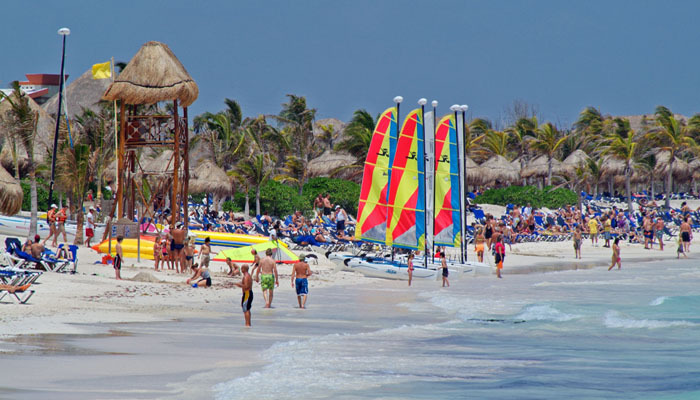 The Dreams Tulum sits on two miles of powdery white sand with everything to make the whole family happy. Just a short drive brings you to a lush ecological nature preserve. And you’re right on the ocean for snorkeling, catamarans, sailing, windsurfing, kayaking and there's even an ocean trampoline. Take an easy-guided bike tour to the ancient Mayan ruins of Tulum, one of the world’s great mysteries. There’s tennis, football, dance lessons, weekly beach parties or just lazing by the sparkling pool and Jacuzzis. GREAT FOR FAMILIES - ADULTS & WEDDINGS! RIU Palace Riviera Maya & RIU Palace Mexico Best for adults & couples - Incorporating personalized touches of decadence and distinctive pampering coupled with superb service, this luxurious hotel creates a lasting impression of paradise for each and every guest. 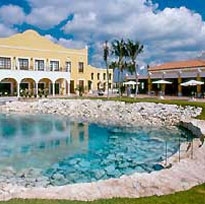 Riu Palace is located in Playacar on a beautiful palm lined beach. SECRETS Capri Couples Paradise! This elegant resort stands well apart from the ordinary all-inclusive. No buffet lines, house brands or overbearing staff. Instead, a la carte service of the finest food and beverages, a superior selection of amenities and a team of professionals who make your comfort their only concern. Classy, well located and on beautiful beach. Outstanding personal service. The spa is among the best in the area. Ideal for a luxury romantic getaway. Beautiful suites & swim out rooms. 8 Restaurants & 10 Bars. Located in the heart of Playa Del Carmen, This luxurious resort was Designed for relaxation, polished guestrooms feature a Jacuzzi and a private terrace, while the full-service European spa provides a serene environment that perfectly compliments a day of relaxation and fun. IBEROSTAR Paraiso Lindo Couples Adults & Families Among the best all-inclusives for families with kids. Renowned for good food and children activities. 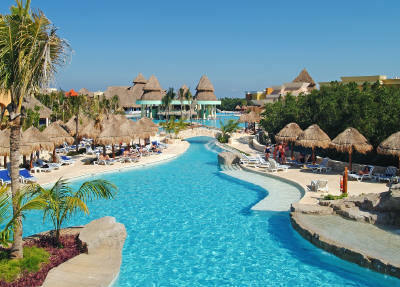 Wave Pool, Lazy River and one of the most beautiful beaches in all of Mexico. Excelling dining / great kids facilities. Perfect for couples, adults & families alike. One of our longtime favorites, located on a powdery white sand beach in Playacar this family friendly resort complex offer 7 restaurants and 7 bars, fantastic kids club & perfect beach setting. Family friendly. Kids stay free!!! Perfect for Families OR adults. 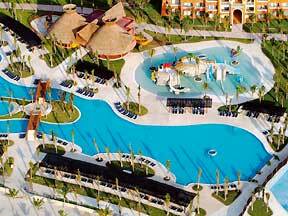 Barcelo Maya Tropical & Colonial Resort Beach-Lovers Paradise! Located on one of the best beaches, this elegant resort offers 8 restaurants, including 4 specialty restaurants, plus 6 bars. There are 3 pools, two for relaxation and one for activities and water sports. Great for singles, couples & all age children. A great choice for families and adults, this deluxe resort features spacious guestrooms, a fine selection of restaurants and bars, a discotheque, a fitness center and spa, and an exciting kid’s club and teen’s club. Very nice for couples & Families. This 5-star family resort offers it all! Gourmet dining in the 6 restaurants with no reservations required! Super beaches, lots of daily activities, kids club, nightly entertainment and themed party nights. Parents & kids will love their stay here! El Dorado Royale is Mexico’s premier adults-only, all-inclusive beachfront resort for couples, honeymooners and weddings. Luxuriously romantic, stretching along a secluded beach, it provides indulgences from gourmet cuisine, to hot tubs and hammocks in every junior suite, to a full service spa. Located in Playacar, close to the Riu Complex, this luxurious hotel creates a lasting impression of paradise for each and every guest. Fronting a beautiful stretch of white-sand beach, it boasts an exquisite selection of dining options and family-friendly facilities including a children’s pool and playground. 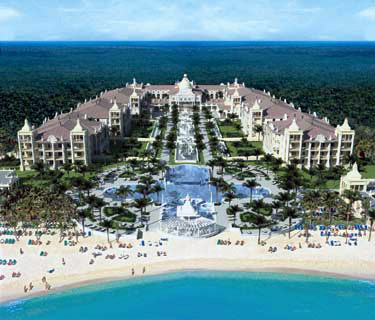 IBEROSTAR Grand Paraiso COUPLES & ADULTS - OPENS MARCH 07! This flagship hotel is located in Playa Paraiso complex. All rooms Jr Suites, guest can enjoy all the facilities in the entire complex. They offer gourmet dining, 24 hour room service and international drinks as well as a state of the art spa and 18 hole golf course.